My 02 Accord has Eibach swaybars on it that were installed prior to when I got it. I helped with the install back then, and it doesn't seem that long ago (two years), but the rear has been clunking a lot while driving recently. This weekend I was finally able to pinpoint what the heck it was. The rear swaybar bracket bushings had worn to the point that the bar could move in the bushing. It took me forever to find, because when I jacked up one side, it would preload the bar causing it to be firm/not move. But I could see a bit of daylight between the bar and a bushing, so I jacked up the whole rear and it became obvious - I could then literally move the bar causing the "clank" that I had been hearing for some time now. My question is - the PN on the Eibach bushing reads 5718 and says 23mm, but as far as the internet shows, I can't order just the bushings from Eibach. I see that there are several aftermarket 23mm sway bar bushings on the market. Just wondering if anyone has used an aftermarket bushing with the Eibach rear bar and if so, which one. I've also read that if I contact Eibach and provide a receipt/proof of purchase (which the previous owner can supply for me), that they'll ship me out a replacement at no cost. I'll probably give that a try, but thought I should ask about the aftermarket replacements and see what the community had to say. BTW - just for kicks, here is a pic of one of the rear swaybar bushings that Eibach supplies with their pro kit. Just thought I would follow up on this thread that I posted my question in. I called Eibach today and spoke with one of their Customer Services reps (Jared). He was very knowledgeable and helpful. He said that the bushings in their kits have a 1 year limited warranty, unlike the bars that have a lifetime (million mile) warranty. They do sell the bushings individually for $8.00 ea (+ freight & 3% CC fee), their Part Number is ES5718. They are in stock and they have plenty of inventory. He also told me that Eibach has Energy Suspension (ES) manufacturer all of their bushings for their products. That being the case, any 23mm ES bushing will work for the sway bar kit. He thought that the ES kits (set of 2 w/ brackets) usually ran around $20 or so on the internet, so it may prove to be a cheaper alternative. 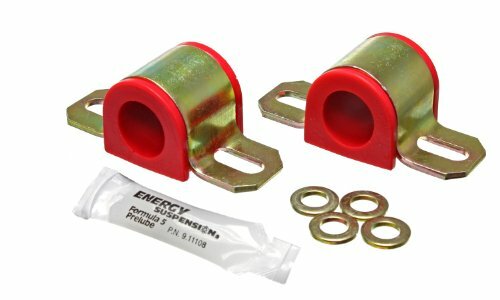 He did mention that the only difference between the bushings in the kit and the bushings sold individually by ES is that the kit bushings (provided by Eibach in the kits) are designed to work specifically with the OEM brackets that are on cars equipped from the factory with the front/rear sway bars. The bushings sold individually from ES may actually be a bit thicker in some areas, but that when used along with the brackets that come with the bushings, should have not issues on OEM applications. 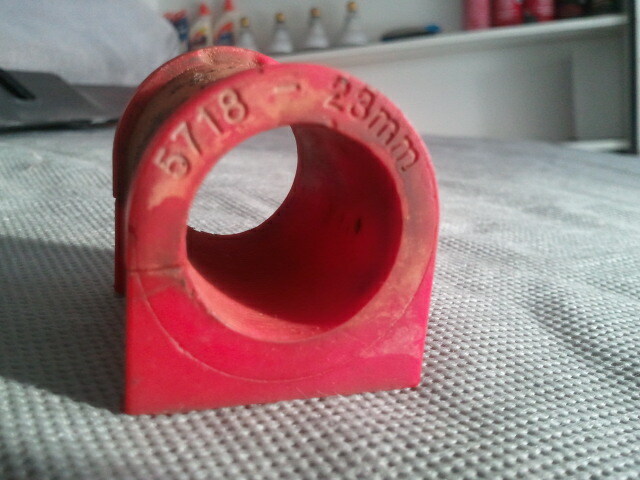 Looks like I'll be looking online today for some ES 23mm bushings. Hope this helps someone else that may have the same question as I did. See Here: http://www.energysuspensionparts.com...r-Bushings.asp for a comparison in size between the 9.5127 & 9.5115. Some measurements are different, so you'll need to check your application before ordering. The greaseable version is only available in 1 size, check the measurements on the website listed above to see if this will work for your application. Last edited by Mopar McNeer; 09-18-2013 at 02:12 PM. 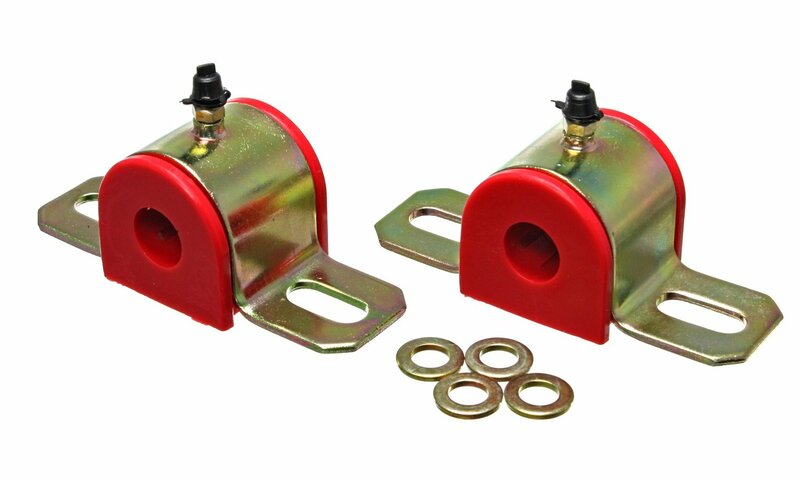 I see also that you can buy just the bushings (sans brackets) from Energy Suspension as well (looked at some on Ebay). Last edited by Mopar McNeer; 09-18-2013 at 02:16 PM. I thought I'd update this old thread with some things I found out (hindsight feedback & current pricing/PN info). First off - the aftermarket Greaseable Energy Suspension bushings listed above didn't find my Honda. The ES brackets were much too large to work with the factory bolt holes - it's possible that the bracket could be modified, but it wouldn't be optimal as to how far in the bolt pass-through openings would need to be enlarged to be able to hit the bolt holes. And the bushings were much too large to work with the factory hardware, again you might be able to shave them down to work, but it just wasn't optimal. I contacted Eibach today (800-507-2338) to get replacement bushings for both front and back (as I just noticed this weekend that one of there fronts was partially destroyed). After speaking with the sales rep Anna (ext 138), she informed me that I could either buy the bushings individually or in hardware kits. The hardware kits were actually cheaper than buying individual bushings too, so I went that route. Anna was nice enough to provide me a small discount on the back kit, charging me $25.92. I'll post up pictures of the kits once they arrive so you can see what is included. Hopefully the rears will last a bit longer this time. I'm considering drilling and tapping the OE rear brackets and installing zerks so that they can be greased. We'll see. Quick Reply: Replacement Eibach Rear Swaybar Bushing availability?